Medieval priests and monks had always been preachers, but in the late middle ages preaching became an especially important activity for them. Society was becoming more complex, especially in the growing towns and cities. Laity who were wealthy, politically influential and often literate but outside the traditional three social categories (rulers, fighters, serfs) were growing in numbers. The church had to take a more direct approach to communicate with these urban, secular people, who often desired more personal religious participation. More effective preaching was one of the responses to the new needs. This manuscript from St Augustine's monastery, Canterbury, contains a handy thematic range of preaching materials which a monk or canon could mine for moralising anecdotes to incorporate into his sermons. The first page of the 'Gesta Romanorum' or 'History of the Romans', begins by speaking of examples of good. Instead of accounts of historical events, anecdotes giving examples of virtues and vices make up the book's contents. Each story has a heading to identify its theme and concludes with a moralising thought. 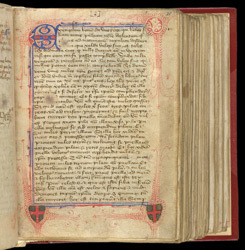 The 'History' was extremely popular, acquiring local additions, which give each manuscript a unique content. The original book may have been written in England. Its influence was long-lived, providing material for writers from Chaucer to Rosetti.